A Hawaiian hike has earned the nickname “stairway to heaven” because of the stunning views it offers — if you can stomach the ascent up A narrow, dangerous and totally forbidden set of steps. 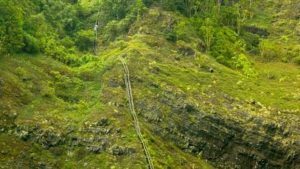 But the Haiku Stairs, an estimated 3922 steps winding up the Ko’olau mountain range near Waikiki on the island of Oahu, may have been destroyed forever. A powerful storm on the Valentine’s Day weekend badly damaged the already decaying steps, causing a landslide and “mangled” railings, reports KITV News. “We urge people please don’t go on the stairs, it’s not safe,” said Ernest Lau, Manager and Chief Engineer at the Honolulu Board of Water Supply, which has long employed security guards to keep people away from the stunning but dangerous trail. The metal stairway was built in the 1950s to allow the US Coast Guard access to radio transmitting station atop the mountain range. The worn, dangerous trail was closed to the public in 1987 and, though the stairway was restored in 2003, it’s still illegal to access it. That hasn’t stopped hundreds of hikers from attempting to scale the summit, risking arrest by Honolulu police — or worse. Even after the destructive storm, trapped hikers have had to be rescued from the stairs by the Honolulu Fire Department. Some fed-up locals, who have gone as far as constructing booby traps to snare trespassers, hope the stairs will now be torn down rather than repaired.